Today, I’m trying to do my analysis during the commercial break before Final. I bet Catherine wishes she had read Watchmen, which is named for another translation of that Juvenal quote. That would have put her in the lead heading into Final… alas. This is another example of the Strong Form of Shore’s Conjecture, with mind games galore. 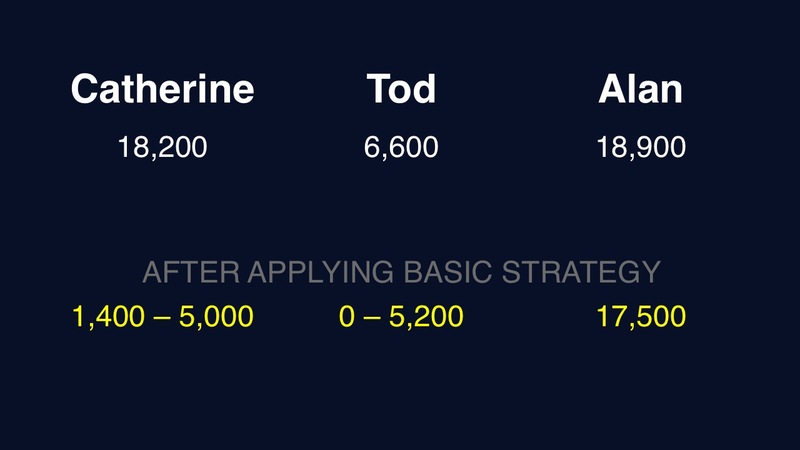 Alan should wager 17,500 to cover Catherine. Catherine can wager up to 16,800 to stay above Alan if they’re both wrong. Tod can wager up to 5,200 to stay above Alan should they both miss. Catherine can guarantee she won’t lose to Tod by capping her wager at 5,000. Catherine should wager 700 to cover a zero by Alan, and 1,400 to cover an “unsafe” wager. Because Catherine can simultaneously cover Alan’s score and stay ahead of Tod, we have Shore’s Conjecture. Let’s say Catherine goes for that 5,000 wager. Alan would best respond by wagering 4,300. If he’s wrong, he’ll have 14,600, which means Catherine should cap her wager at 3,600. 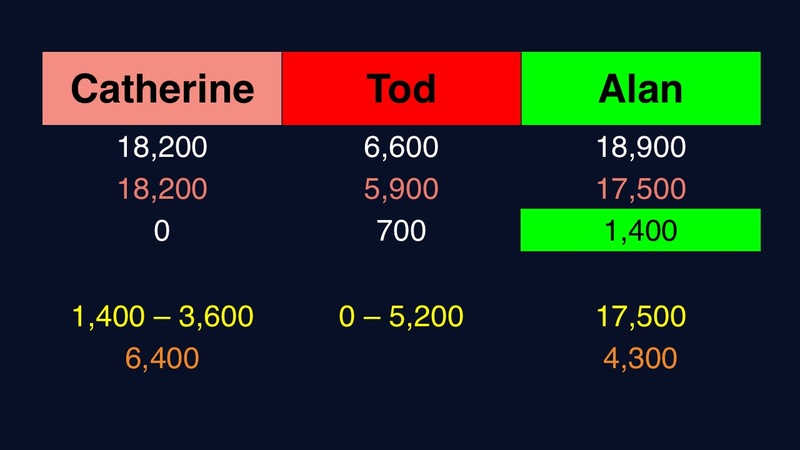 If Tod gets it right with his 5,200 wager, he’ll have 11,800 – so perhaps Catherine could wager up to 6,400 if she’s afraid of that smaller wager out of Alan. I have plans to go to a few tapings this coming week in Culver City. Perhaps I should reconsider my plans lest I be held hostage for the $35,400 this cost Sony Pictures Studios. Now, I must admit there’s less of a reason to offer a tie in this particular situation. 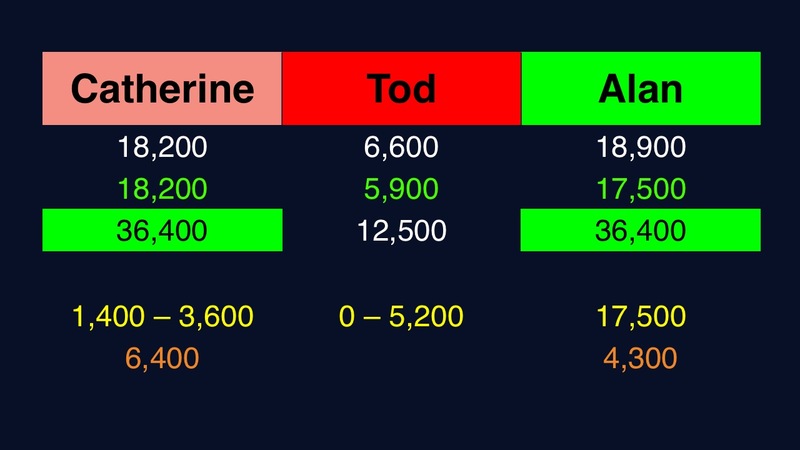 If Catherine thinks you’re going for the tie, you’ve done your job; there’s no harm in adding the extra dollar against Catherine (unless you’re afraid of the 5,200 wager out of Tod, which it appears he was trying to do, but messed up the math). 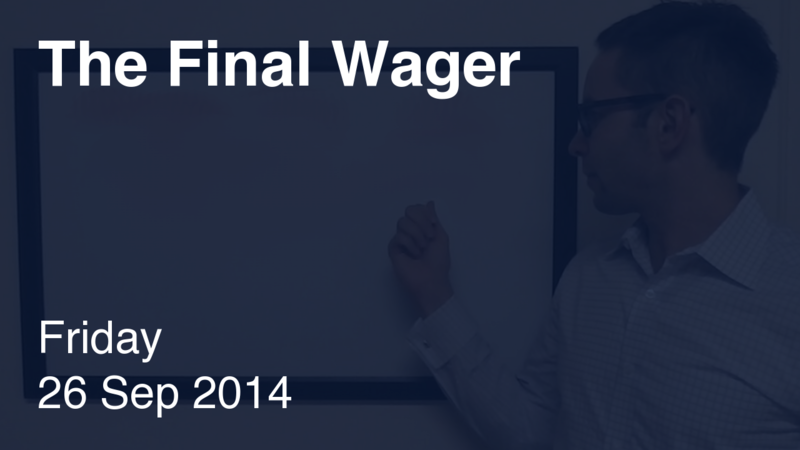 The tie wager relies in large part on whether subsequent players know you’ll offer it. This was the last game in a taping session; at most two potential opponents – the alternate(s) for that day – will have seen that you’ve offered the tie in the past. I explain the psychology behind this in my video on Arthur Chu’s tie game in January. Standing up there just trying not to screw it up. Lots of adrenaline after DJ. I double and triple checked that I’d bet enough to cover Catherine doubling up. It never did occur to me to add the extra for the win. No alternates left. We had a no show and only ten (plus Matthew) in the green room. Tod and Dolly were the locals.